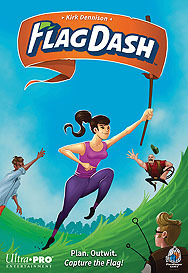 In Flag Dash, you play as one of several childhood friends who promised to play their favourite pastime again after they "grew up". Secretly plan your moves to outmanoeuvre the opposing team in an exciting game of capture the flag! Will your opponents ruin your plans, or will you return home victoriously with the flag?